It’s ironic that a player who’s best remembered for the slogan “We’ll win plenty with Sam Dente” would have played almost half his career for two organizations synonymous with losing, the St. Louis Browns and the Washington Senators. It was during his three-year Senators tenure from 1949 through 1951 that the slogan was first seen on a sign, but the prediction didn’t really come true until Dente was signed by the 1954 Cleveland Indians. His play as a utility infielder, ultimately taking over the starting shortstop job when regular George Strickland went down with a broken jaw, was a big part of the Indians’ 111-win season. Dente, a 5-foot-11, 175-pound right-hander, was often called in the press a “good-field, no-hit” infielder. For only two seasons did he hold down a steady position with a major-league club. What kept him in the majors was a rifle arm combined with the athletic ability to play all of the infield positions well. In his prime, he was the ultimate utility infielder. He was a fiery competitor, quick to anger – mostly at himself. He was a serial water-bucket kicker, often being fined for ruining a dugout water bucket after striking out1. The practice eventually came to an end in one game when someone filled the water bucket with sand 2. But Dente was also the clubhouse comedian, keeping the locker-room mood light with his hijinks3. Samuel Joseph Dente was born on April 26, 1922, in Harrison, New Jersey, to Italian immigrant parents Joseph, a railroad laborer, and Lena Dente. Both of his parents immigrated to the United States in the 1890s. Sam was the youngest of six children, with four sisters and a brother4. Dente excelled at two sports as he grew up. He was a fine centre-half for the Kearny High School soccer team5. He was so good that after high school, Dente played professionally in the American Soccer League for the Kearny Americans6. But Dente also shined at baseball. He played shortstop for Kearny High and, in 1941, was a finalist in the New York World-Telegram’s Most Valuable Baseball Player contest for high-school players from New York and vicinity7. More than 50 years later, the Newark Star-Ledger named Dente to its high-school baseball All-Century team for the 1940s8. Dente also honed his skill in the American Legion junior ball program9. Naturally, a player of Dente’s ability started to draw attention. The first person to talk to him was Jack Tighe, player-manager of the Muskegon Reds in the Detroit Tigers organization and a neighbor of Dente’s in Kearny. In 1941 Tigers general manager Jack Zeller offered Dente a bonus for signing and sent him to Newark and Jersey City, where he worked out with the Tigers’ International League team, the Buffalo Bisons10. What happened next is up to dispute. In 1950 The Sporting News reported that the Tigers cut Dente after watching him bat against hard-throwing Virgil Trucks, who amassed four minor-league no-hitters before starting a 17-year major-league career. But Dente told Baseball Digest in 1954 that Bisons manager Al Vincent never allowed him to bat when he was with the team, yet Vincent reported to the Tigers that he wasn’t much of a hitter11. Whatever happened, the Tigers weren’t interested in keeping Dente. The Red Sox jumped in. Their scout Jack Egan signed Dente to a contract and sent him off to the Owensboro Oilers of the Kentucky-Illinois-Tennessee League12. Dente had little trouble adjusting to the Kitty League offensively, batting .273. But he struggled defensively playing shortstop for the Oilers. In 77 games, he committed 44 errors for a .901 fielding percentage. But the Red Sox saw enough potential that they moved Dente to Greensboro in 1942. At Greensboro he improved his defense but struggled with the bat. Yet despite his hitting only .209, he found himself moved up another classification, this time to Scranton for the 1943 season. Dente managed to make it to training camp after his discharge and was placed back with Scranton for the 1946 season, as were many of his former 1943 teammates who had gone away to the war. As a result, Scranton was loaded with talent. Instead of playing shortstop, Dente was moved to third base. He, and the Scranton Red Sox as a whole, had a tremendous season. Dente hit .289 in 134 games and proved an asset in the field. But Dente still was a liability with the bat. Sporting News correspondent Jack Malaney wrote, “It appears that Dente is not ready for Major League pitching.”33 By season’s end, Dente was hitting only .232. The Red Sox, who finished third in the American League, were looking to upgrade at several positions so on November 18, they traded Dente, pitcher Clem Dreisewerd, minor league infielder Bill Sommers, and $65,000 to the St. Louis Browns for pitcher Ellis Kinder and infielder Billy Hitchcock. Despite the successful integration of baseball in 1947, Organized Baseball was still holding its collective breath, worried that an incident might occur on the field between a white and black player that would have racial implications. It was an incident involving Dente that proved that, as far as play on the field goes, it would be business as usual. It occurred during a spring-training game between the Browns and the Cleveland Indians at Wrigley Field in Los Angeles. While Dente was playing shortstop, Larry Doby accidentally spiked him while stealing second. There was no altercation between the two players though Dente had to leave the game to be tended to. While Dente didn’t crack the regular lineup at the start of the season, he still helped the Browns to a surprising winning record as June began. He batted over .300 in mostly pinch-hitting and utility roles.36 The Browns, however, soon fell into their normal pattern and finished the season 37 games back of the Cleveland Indians. 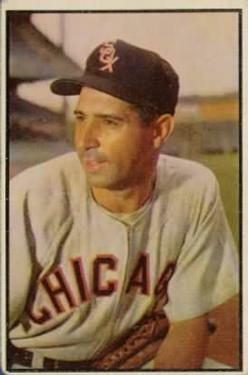 Dente had a good season as a spot starter for regular shortstop Eddie Pellagrini. Dente started 57 games at shortstop and four at third base. He hit .270 in 98 games for the Browns. When the 1949 season started, Dente was the Senators’ starting shortstop. Despite the changes, the Senators got off to a bad start. After dropping a doubleheader to the Philadelphia Athletics, the Senators stood at 3-11 and in the midst of a 14-game road trip. Things looked bleak. But the Senators won nine straight games before dropping their last game of the road trip. While Dente had a good season with the bat, it wasn’t as good defensively. He led the league in errors. Yet despite Dente’s fielding, Senators owner Clark Griffith declared him “an untouchable” in the offseason.45 Right before spring training, Griffith raised Dente’s salary.46 Clearly, Dente was a popular player both with the fans and the Senators’ front office. When the season began, Dente was the Senators’ starting second baseman. But at the end of May, the Senators obtained second baseman Cass Michaels in a trade with the White Sox. Michaels, who had hit .308 in 1949, would add another good hitter to the Senators’ lineup. So with Michaels penciled in at second, Dente moved back to shortstop. He struggled with the bat throughout 1950. He finished the season with a .239 average. These weren’t the numbers the Senators were looking for from Dente, who had started every game of the season. Shirley Povich wrote that he “was the biggest disappointment on the Senators.”47 And there were plenty of disappointments to go around as the Senators finished in fifth, 31 games behind the Yankees. So going into the 1951 season, Dente would have to earn his position. The Senators brought in a couple of shortstops from the Southern Association, Atlanta’s Gene Verble and Chattanooga’s Willy Miranda, to challenge Dente in spring training.48 He didn’t handle the pressure well, going hitless in 18 straight games in spring training.49 Toward the end of spring training, he started hitting again and entered the season with optimism. But his hitting woes continued through the beginning of the season. Manager Bucky Harris replaced him with both Verble and Miranda but they hit even worse than Dente.50 By June 6 Dente was hitting a paltry .218. Harris was trying everything to shake up his Senators, who were second-to-last in team batting in the American League. Finally, in late June, the Senators called up shortstop Pete Runnels from Chattanooga. Runnels was tearing up the Southern Association, batting .356.51 Dente went to the bench for much of the rest of the season as the Senators staggered toward a seventh-place finish. Only the lowly Browns kept them out of the cellar. Dente finished the season with a .238 batting average. With all the third basemen in camp, rumors of trades swirled. Dente was reported to be headed to the Detroit Tigers.54 But in the end, Dente stuck with the White Sox, winning a utility infielder position helped by his .354 batting average in spring training.55 He filled in at every infield position as the White Sox battled in a pennant race. He even played six games in the outfield – by far the most versatile player in the American League that season.56 But he played in only 62 games and finished the season with a .221 batting average, easily his worst hitting season in the major leagues, as the White Sox finished in third, 14 games behind the Yankees. After the season Dente worked at the Brooklyn Division of the American Baseball Academy, which was a baseball program aimed at juvenile delinquents.57 Teaching baseball would become a passion of his through the years. He often worked camps throughout the rest of his career and years beyond. The Cleveland Indians wasted little time in getting Dente onto their roster. They sent outfielder Mike Lutz and cash to Indianapolis for Dente and pitchers Marion Murszewski and Don Mossi.62 When Dente reported to spring training in 1954, he found he was in competition with Hank Majeski and Owen Friend for two utility infielder spots.63 Friend eventually lost the battle and Dente found himself back in the big leagues. On April 2 the Cleveland Plain Dealer ran a story in its “Batting Around” column about Dente and the signs from his Senators day that read “Win plenty with Dente.”64 It would mark the resurrection of the slogan as the Indians magical 1954 season progressed. Dente was forced into a starting role in June, when second baseman Bobby Avila went down with an injury.65 While starting, Dente struggled with the bat, then was hurt when he collided with teammate Dave Philley while chasing a pop fly. The injury put him on the shelf for ten days.66 After he rejoined the team, other than a few spot starts to relieve the slumping George Strickland, Dente was on the bench again.67 But the Indians were in the midst of the pennant race and Dente would play a big part in their success. Dente played some of the best baseball of his career while replacing Strickland. On September 1 he was batting .276 and was second in the American League in fielding percentage at shortstop. To top it off, he hit his fourth (and last) major-league home run off the Yankees’ Whitey Ford. After the Indians won the American League pennant, Greenberg, in Life magazine, wrote, “Sam Dente … did all the things our star, George Strickland, did before suffering the broken jaw.”77 Al Lopez was even more impressed. He said that Dente was “the fellow who gave us the greatest lift when we needed it the most.”78 In 68 games Sam batted .266 and drove in 19 runs. With Strickland back at full strength, Dente sat the bench for most of the World Series against the New York Giants. He got into Game One as a defensive replacement for Strickland in the eighth inning and had a sacrifice bunt in the tenth inning in the Indians’ 5-2 loss. In Game Two he again was a defensive replacement in the eighth. He saw no action in Game Three. In Game Four, with the Giants on the verge of a four-game sweep, Lopez started Dente for Strickland. Strickland had been hitless for the Series and Lopez needed a spark. Dente didn’t fare much better than Strickland, going 0-for-3 with a walk and a run scored as the Giants won, 7-4, and swept the Series. In spring training in 1955, The Indians, looking to upgrade their utility-infielder positions, brought in veteran Eddie Joost to compete with Dente.79 Joost, who never signed a contract with the Indians, left halfway through camp to sign with the Red Sox.80 So Dente entered the 1955 regular season again as one of the Indians’ backup infielders. Unlike 1954, Dente didn’t play well in replacing Strickland in 1955. By June 22 his batting average stood at .210 in 40 games. After that, Dente played little, getting into 33 games the rest of the season. He did manage to pull his batting average up to .257 by season’s end but it was clear that the Indians, who had finished second, three games back of the Yankees and sixth in AL team batting, were looking to make changes in the infield. In the late 1960s Dente began working at Merit Mailers, a direct-mailing house in Newark, where he became a vice president.102 He worked there until his retirement. Dente had moved to West Caldwell, New Jersey, after the 1955 season and remained there until his death on April 21, 2002, five days shy of his 80th birthday. He died at Mountainside Hospital in Montclair, New Jersey. Dente was remembered a few years after his death when his grandson, Rick Porcello, was taken in the first round of the 2007 free-agent draft by the Detroit Tigers.103 Another grandson, Jake Porcello, was drafted in the 48th round by the Tigers in 2009. Jake decided to attend Seton Hall University instead. To the end of his life, though he played on some terrible teams, Sam was best remembered for the catchphrase “Win plenty with Dente.” While reminiscing on his career in 1973, Dente told the Cleveland Plain Dealer, “I still hear the ‘Win plenty with Dente’ slogan quite often.”104And in 1954, the Cleveland Indians certainly did. 1. Mansfield (Ohio) News Journal, July 2, 1967. 2. The Sporting News, July 4, 1961. 3. The Sporting News, August 25, 1954. 4. 1930 United States Census. 5. Trenton (New Jersey) Evening Times, November 16, 1939. 6. Brooklyn Eagle, August 14, 1947. 7. New York World-Telegram, June 25, 1941. 8. Newark Star-Ledger, April 17, 2007. 9. Undated newspaper article from Dente’s Hall of Fame file. 10. Bendel, Fred. “ ‘No Hit’ Dente Hit At Short.” Baseball Digest, (March 1951), 91-92. 12. The Sporting News, January 3, 1951. 13. The Sporting News, February 4, 1943. 14. U.S. World War II Enlistment Records, 1938-1946. 15. Red Bank (New Jersey) Register, April 3, 1973. 16. The Sporting News, March 30, 1949. 17. Lowell (Massachusetts) Sun, March 7, 1947. 18. Binghamton (New York) Press, November 12, 1946. 19. New Orleans Times-Picayune, September 25, 1946. 20. The Sporting News, December 25, 1946. 21. The Sporting News, December 4, 1946. 22. Cleveland Plain Dealer, July 14, 1947. 23. Lowell Sun, March 14, 1947. 24. The Sporting News, March 19, 1947. 25. The Sporting News, March 26, 1947. 26. The Sporting News, April 16, 1947. 27. Lowell Sun, April 18, 1947. 28. The Sporting News, July 16, 1947. 29. The Sporting News, July 23, 1947. 30. Undated newspaper article from Dente’s Hall of Fame file. 31. The Sporting News, August 6, 1947. 32. Undated newspaper article from Dente’s Hall of Fame file. 33. The Sporting News, August 13, 1947. 34. Trenton Evening Times, March 17, 1948. 35. The Sporting News, March 31, 1948. 36. The Sporting News, June 2, 1948. 37. Eric Stone, Wrong Side of the Wall: The Life of Blackie Schwamb, the Greatest Prison Baseball Player of All Time (Guilford, Connecticut: Lyons Press, 2004), 121. 38. The number of people on the parade route varies in sources from 5,000 to 10,000 people. Tom Deveaux, The Washington Senators, 1901-1971 (Jefferson, North Carolina: McFarland & Company, 2005), 174; The Sporting News, October 19, 1949. 39. Bob McConnell and David Vincent, SABR Presents The Home Run Encyclopedia (New York: Macmillan, 1996), 450. 40. The Sporting News, July 6, 1949. 41. The Sporting News, September 14, 1949. 42. The Sporting News, August 31, 1949. 43. Cleveland Plain Dealer, September 30, 1949. 44. Brooklyn Eagle, September 29, 1949. 45. The Sporting News, November 23, 1949. 46. Dallas Morning News, January 13, 1950. 47. The Sporting News, March 28, 1951. 48. The Sporting News, January 31, 1951. 49. Amsterdam (New York) Evening Recorder, March 26, 1951. 50. The Sporting News, June 6, 1951. 51. The Sporting News, July 30, 1952. 52. Springfield (Massachusetts) Union, November 28, 1951. 53. The Sporting News, February 27, 1952. 54. Springfield Union, March 11, 1952. 55. The Sporting News, April 23, 1952. 56. The Sporting News, December 24, 1952. 57. The Sporting News, November 19, 1952. 58. Cleveland Plain Dealer, May 6, 1953. 59. The Sporting News, June 24, 1953. 60. Logansport (Indiana) Press, September 22, 1953. 61. Nashua (New Hampshire) Telegraph. October 28, 1953. 62. Rockford (Illinois) Register-Star News, October 28, 1953. 63. Amsterdam Recorder, March 22, 1954. 64. Cleveland Plain Dealer, April 2, 1954. 65. Kalispell (Montana) Daily Interlake, June 11, 1954. 66. Augusta (Georgia) Chronicle, June 14, 1954. 67. Lima (Ohio) News, July 15, 1954. 68. Cleveland Plain Dealer, July 16, 1954. 69. Undated newspaper article from Dente’s Hall of Fame file. 70. Corpus Christi (Texas) Caller-Times, July 25, 1954. 71. Lima News, July 28, 1954. 72. Cleveland Plain Dealer, August 7, 1954. 73. Brooklyn Eagle, September 1, 1954. 74. Cleveland Plain Dealer, September 10, 1954. 75. Corpus Christi Caller-Times, September 10, 1954. 76. The Sporting News, September 29, 1954. 77. Hank Greenberg, “How We Got Into the Series,” Life, September 27, 1954, 138-152. 78. Brooklyn Eagle, November 9, 1954. 79. Cleveland Plain Dealer, January 24, 1955. 80. Cleveland Plain Dealer, March 28, 1955. 81. The Sporting News, June 15, 1955. 82. Oil City (Pennsylvania) Derrick, June 16, 1955. 83. Racine (Wisconsin) Journal-Times, June 16, 1955. 84. Sandusky (Ohio) Register, October 17, 1955. 85. The Sporting News, November 23, 1955. 86. Red Bank (New Jersey) Register, May 24, 1956. 87. Red Bank Register, May 24, 1956. 88. Cleveland Plain Dealer, April 16, 1970. 89. The Sporting News, December 14, 1955. 90. Racine Sunday Bulletin, November 13, 1955. 91. Abilene (Texas) Reporter-News, February 16, 1956. 92. The Sporting News, February 29, 1956. 93. Kalispell Daily Interlake, March 20, 1956. 94. Red Bank Register, April 3, 1973. 95. Red Bank Register, April 3, 1973. 96. Cleveland Plain Dealer, August 23, 1956. 97. The Sporting News, September 5, 1956. 98. Red Bank Register, April 3, 1973. 99. Connellsville (Pennsylvania) Daily Courier, January 22, 1959. 100. Hagerstown (Maryland) Daily Mail, August 7, 1967. 101. Red Bank Register, May 24, 1956. 102. Sandusky Register, February 7, 1969. 103. Newark Star-Ledger, April 17, 2007. 104. Cleveland Plain Dealer, April 16, 1970.